Guy Kawasaki recently previewed an autobiographical book by Steve Wozniak, took some sideswipes at innovators, and cited some bad advice to entrepreneurs. Why? I guess it’s fun. Or maybe to get himself higher on the Technorati ranking by provoking posts like this. First, Guy ridicules market research and focus groups. Granted that these have a lot of problems, particularly when investigating novel ideas and innovative products. Ignoring market research is a great way, however, to make sure that VCs and potential business partners have no interest in your business proposition. “Trust me, I know what the consumer wants! Research? Who needs research?” There are a small number of entrepreneurs in Silicon Valley who are able to create interest in their company based solely only on their vision and reputation; the rest of the people have to provide proof up front. This proof doesn’t have to be focus groups: a user-oriented development process like IDEO’s can go a long way to showing value, as can getting your product into Geoffrey Moore’s bowling alley. Don’t waver and Trust your instincts—good to a point. Sure, there are times to ignore the nay-sayers and those who want you to sacrifice your vision to their god of Safe Mediocrity. Taking the advice of 10 different advisors can be like having 10 chefs in the kitchen—inspired flavors become a bland mess. Many successful companies, however, have had to instigate one or more changes in their business plan or technology application until they found their groove. The entrepreneur has to be flexible and able to change their plan when necessary. Or be noble and unwavering and go down with their sinking ship. What can I say about the advice Work alone except that most everyone these days is looking to interdisciplinary collaboration to produce innovations, both in industry and academia. Again, there will always be exceptions, but not every entrepreneur is Wozniak with Apple’s opportunity in their back pocket. I’m sure that the book is a great read and is inspiring. It’s just that most success stories do not resemble the Apple startup paradigm. Playing games to improve one’s mental capabilities is becoming an increasingly popular pastime. Research has shown that doing crossword puzzles regularly can help counteract Alzheimer’s. I suspect that part of the popularity of Sudoku is the assumption that daily mental exercises is probably a good thing. Nintendo games that are intended to exercise gray matter have become popular among adults in Japan. Dr Kawashima’s Brain Training game for the Nintendo DS handheld platform has sold nearly 2 million copies in Japan over the past year and has received attention by the BBC and the most recent podcast of CNet’s This Week in Technology (TWiT). Apparently the game has just been released in the US, so don’t be surprised if you start seeing adults playing with Nintendos on your next flight instead of watching Big Momma’s House II—the commentators on TWiT say that the Brain Training is fairly addictive. One of the tasks in the game is a classic cognitive task: identify the color of a word when the word spells a competing color, e.g., the word “green” appears on screen in the color orange and you have to answer "orange" and not "green". The person playing has to speak the color of the letters (not what is spelled) into the Nintendo microphone for scoring. This idea of of intelligence-preserving software exercises has made headway outside of the game world. NeuroTone, a startup in the Bay Area founded by the people who started the dot-com-era digital audio company Liquid Audio, has developed a similar type of “brain training” system for new users of hearing aids. Most hearing aid wearers are older and have been listening for years to deteriorated speech through their impaired auditory system. They haven’t heard sounds normally for a long time and their neural plasticity has probably readjusted to respond to distorted sounds. When a hearing aid is first worn, the brain likely needs some training to readjust to the reception of normal sounds again. Neurotone’s software, LACE, contains speech understanding tasks and cognitive tasks that help with such functions as memory. It runs on the person’s own PC and connects to their audiologist through the internet so that their audiologist can monitor their progress. LACE also adapts to the ability of the hearing aid wearer: as the person does better, the tasks become harder so that the person is always challenged. Given the interest in keeping one’s mental ability “fit”, I wouldn’t be surprised if LACE becomes popular with normally-hearing people as adults look for ways to develop their own “brain training” regimen. One interesting aspect of LACE from a hearing aid company’s perspective is that not only is LACE innovative as a product in itself, but it proposes an innovative business model for companies that integrate LACE with their products. The software training program provides a connection between the audiologist or hearing aid company with the hearing aid wearer long after the time of purchase. It makes wearers excited about using their aids—actually looking forward each day to the “brain training” exercises that help them better use their aids. Imagine if other products could create that kind of connection and dedication from their users. People don’t read manuals, and if they do they have usually become an annoyed customer. Imagine if you could teach your customers how to optimally use your product with an interactive game. Or turn a moderately satisfied customer into a passionate user. Creating that kind of dedication towards one’s product is something that most companies don’t even try to imagine, but here’s a system that allows users to get excited about becoming better users of a product, and obtaining improved benefit from the product as well. With LACE, some audiologists are actually setting up PCs in their lobby so that patients who don’t have PCs at home can come in every day and obtain their mental exercises. In the consumer product field, who wouldn’t want to give their customers a reason to return to the point of purchase? Of course, audiologists are providing LACE as a part of a best-practices approach to providing benefit to their patient. In other product areas, however, the LACE business model is an example of how to better engage with one’s customers. People should be searching for similar ways to get their customers excited about learning and becoming better users of their products. How can the “brain training” model work for your customers and inspire them to improve the benefit they receive from your product? The IBM Global CEO Study: Expanding the Innovation Horizon has just been published. It is 56 pages of data and analysis of interviews of 765 worldwide CEOs on the topic of innovation within their own companies. The report organizes its analysis around three key findings. It’s not surprising that this group of high-powered CEOs would name themselves as being the ones resposible for driving innovation within their companies. More surprising is that less than 3% of CEOs said that their heads of R&D were responsible for innovation, suggesting that a significant portion of innovation is being applied to corporate areas other than product development (more on what those areas are later in this post). Team-oriented work that involves cross-group collaborations is a theme throughout the report, and it comes up in the other two key findings. 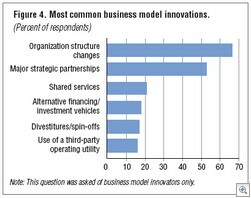 Companies that have grown their operating margins faster than their competitors were putting twice as much emphasis on business model innovation as under-performers. Companies, of course, have many tools with which they can compete, and it is perhaps not surprising that they are choosing to innovate across different disciplines. Corporate innovation is not confined to product development, as discussed many places (Doblin, niblettes, Dave Pollard). One of the most interesting findings is that companies are placing a high priority on external alliances to develop innovation. External business partners, customers, and competitors placed highly in the CEOs’ ranking of sources for innovative ideas. The report relayed the frustration of several CEOs with the difficulty of being able to execute on external collaborations. Talking about collaboration is easy, doing so is hard. This relates to a constant theme in innovation: it requires a well defined and rigorous internal process. Collaboration with external companies—possibly even competitors—is an even more difficult process to execute for many obvious reasons. I often find myself talking to colleagues at other companies about collaborative opportunities that could result in industry innovations. Inventing interesting projects that different companies can work on together is, quite frankly, easy. Developing a business plan that proposes value for both companies and describes a strategy that fits both companies’ needs is difficult, and is a gating item to external collaboration. If companies are able to work through all of the difficulties involved in such partnerships, the resulting benefits are tangible, such as shared risk, cost, resources. You can get a summary of the report by registering at the link provided on this page, after which you can request the full report. I’m a little light on my blogging these days. My company recently launched their latest flagship product, so I’m working overtime setting research projects in place for the next generation product line. Innovation takes work, remember? Don’t expect too many posts over the next few weeks. So, I’ll provide some off-the-cuff comments on an interesting post by Pamela Slim courtesy of Guy Kowasaki. It’s sort of a wake-up call to large companies on responsible behavior. I agree with many aspects of the post—please read the whole thing. many of your managers act betrayed when their employees tell them they want to leave the company. I’ve managed some 40+ people and had about half a dozen quite over the past ten years. Some to pursue PhDs, some to start their own companies, some to join a startup. I’ve never been upset about their leaving because I’ve believed that they’re moving on to improve their lives or jobs or interests. Nothing wrong with that. If their current job was a great fit, they would have no reason to leave; if it wasn’t a great fit, good luck with other opportunities and make room for someone who is a better fit. A friend who worked at a competitor once called me to ask if he could try to recruit away an employee of mine. I said go ahead, if you can make their life better than we can, good for you. It didn’t happen. Pamela makes the point in her post that everyone is replaceable and that no job is secure. Sure, but just because someone is replaceable doesn’t mean that they aren’t valuable. This is a mistake that some companies make, devaluing employees because of replacability. Turnover is costly for companies, and some employees are very difficult to replace—particularly ones with expertise intrinsic to their job or industry. Much has been written about how to retain employees, and those theories go hand-in-hand with employee satisfaction and employee productivity. A happy employee is a productive employee is an employee not going anywhere. I’m tempted to make a crap circle demonstrating this concept, but I’m too tired. I can’t say anything about the quality of the conference since I don’t know much more about it than what is on the website, but as a Corante blogger I can offer you a discount to the conference—I don’t get any commision for this. If you go, let me know what you thought. I admit it, I get me some Reality TV every now and then. I like Top Chef because it is about two of my favorite things: gourmet food and San Francisco. Each episode features a guest judge who is usually a top chef at a San Francisco restaurant. Last week’s guest judge was introduced with a caption below them saying “Caterer.” I expected her credentials to be described as “top caterer”, “world-class caterer”, “internationally-known caterer”, or “Ritz-Carlton caterer” but instead it was “Caterer to the Stars.” Wow. Suddenly I was filled with self-doubt, realizing what the true measure of success really was. What had I done with my career? Why wasn’t I anything to the stars? I realize now that I have to recalibarate my goals and get back on track to success. I need to be Innovator to the Stars or Patent Strategist to the Stars, something to make my career meaningful. So, if you’re reading this, Britney Spears, I want to massage all of those great inventions out of your beautiful head and into the USPTO to protect your right to sell. Then I’ll work with you to productize—call me. Tom Hanks, I want to create a patent portfolio for you that rivals your film portfolio. Excluding Joe Versus the Volcano, of course. Your claims will have your competitors crying in frustration while laughing through tears of joy, all without that annoying Meg Ryan. Leave your contact info in a comment on this post—let’s do lunch. The Corante Innovation Hub and its members (Jeffrey Phillips, Paul Gladen, Matt Chapman) have been blogging lately about whether companies should have a Chief Innovation Officer. Business Week recently had an article discussing what makes a CIO, so after reading an article in the latest Business Week on how Whirlpool created innovation within their own company, I thought I’d add a comment or two. First, I’m going to avoid the whole CIO question by saying that what title anyone has depends on the corporate structure within a company. C-titles may not be appropriate. I’ll also state that some companies are simply too small to worry about innovation in the way that larger established companies can. Many companies are too small to support the work necessary to investigate and develop innovative ideas and need to simply focus on their current product line. That being said, large companies don’t necessarily need a CIO or a VP of Innovation. What they need is an innovation process, just like they have a product development process, product rollout process, marketing launch process. Many companies think that the mere fact that they have an R&D department means that they have all they need to create innovation. Wrong. Innovation creation is a process that needs to be developed, planned, promoted and nurtured. Innovation doesn’t just happen. Whirlpool learned the hard way that real innovation requires a lot more than simply urging thousands of employees around the world to tap into their inner designer and then waiting for the great ideas to roll in. It requires hard work, structure, and unwavering discipline. Some people are naturally creative and innovative and have the initiative to push their ideas through a reluctant system. If you happen to have one of them on your staff, congratulations, but that person isn’t enough. Every company needs to figure out how they are going to develop their innovation process. AMD’s head of human resources says in Business Week that “A chief innovation officer needs to be this blend of marketer, technologist, strategist, and business person.” I would also add that this person needs to be creative to develop new initiatives and a leader to convince others to embrace this new process. If you have one of those, put them in charge of your innovation process. If not, create a committee and get help, but do it. Your competitors aren’t going to wait.